If you don't like Gareth Gates, you don't even come close to understanding the fundamentals of pop music. A modern day religion where our set texts are lyrics questioning the big issues of love, life and friendship and who better than Gates as our modern day messiah. A working class lad he's walked with the proles and despite the fact he's been cruelly afflicted by a speech impediment since birth he's managed to find his faith in the lord and overcome his problems with the sort of positivity that puts us all to shame. Who can forget the first time we saw him on Pop Idol and despite the fact he couldn't even gather the confidence to utter his name, he opened his mouth and sang like a angel from above. It was at that moment when we all knew that we'd found a true Idol worthy of our undivided love and attention. When he then went on to explain that his true motivation for entering the contest was to help the needy and make the world a better place it confirmed all we needed to know. He may want the fast life and all the pleasures that go with it, but at the end of the day if he can help people along the way it would save his soul. The fact that he lost out to Will Young in the Pop Idol Contest just adds to one of the most amazing stories in pop. Here was a guy who'd been one of life's losers in every aspect of his life bar singing and despite being the national favourite was pipped to the post at the last minute by a man who had everything. Will had the money and the education, yet still he had no real desire to forge a career in either pop music or politics which he studied during his time at University. He'd had life too easy and it showed in the fact that he simply wasn't passionate about either of his two main interests because at the end of the day he could simply retire back to his parents country retreat and contemplate his navel. Gareth simply lived for pop music and even though he knew that his dream had not ended at that moment, it was a case of hard knock life and yet still he remained positive. 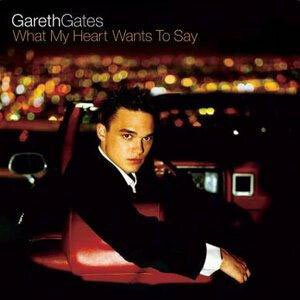 So here we are just over six months later and Gareth has his debut album "What My Heart Wants To Say" as his New Testament. The Twelve Commandments with 33% extra free if you will, with the Gospel of The Gates contained within. An album which is very much a musical representation of Gareth in the fact that it's not afraid to open itself for all to see. Moments of clarity and genius sit next to flawed misadventures and it's what gives the album a human touch. It's easy to forget that this album has been recorded over just a few short months since the program ended and that unlike most pop artists they haven't had two or three years to sift out the gold from the silt. Despite the fact that Gareth only has one songwriting credit on the album (for "Sentimental") you know that throughout the whole process he had a vision of exactly what he wanted the album to sound like. Despite what your initial impression may be, Gates isn't just another production line pop act. Look to the fact that even in the audition process he had already perfected the trademark 2-2-1 formation and had a dream of wearing a white suit before any stylists and image consultants had even heard of this icon from Bradford. Every single aspect of the Gates industry is controlled directly by the man himself and each glorious manoeuvre or Stupid Mistake lies entirely in his hands. After you get over the bad production of "Unchained Melody", something I'm sure with time that Gates will try and distance himself from, and past the fantastic cover of "Suspicious Minds" it's 14 tracks of original material. It's something you have to credit him for as it would have been so easy just to release an album of covers to cash in on the program, but as I said earlier Gates lives for pop music and to simply release a karaoke album would be letting himself down more than anybody else. With his love for Westlife it's natural that that the best moments on the album are the heart wrenching ballads. "Too Serious Too Soon" starts off like the ballad the Beatles never wrote before launching into a chorus steeped in 21st century production values. When he sings "Missing you baby cuts like a knife. What if you were the love of my life" you really believe that Gareth's heart is breaking as sings his last ever message to the girl of his dreams. It's this brutal honesty which separates Gates from every single contemporary pop act you could care to name. Eeach and every line drips with a passion and with someone so young you genuinely feel that's he sound tracking his first real relationship in public. This is not a middle aged man who's lived life and knows the ups and downs of a real relationship. He's walked in with open eyes and looking through an idealistic view of the world and when the real world doesn't match up it hits him all the harder for it. It's what makes the lyrics "When you cry cause the worlds unfair. You can rest assured I'm always there" on "With You All The Time" so believable and the highly charged "(I've Got No) Self Control" so unbelievable. "You're making me hot, you're making me sweat" are probably the least likely thoughts to come out of the mind of a person whose whole life has been steeped in religion. Elsewhere religious references for the first time in pop have a real voice that can connect with the people. Ok, it maybe the old lyrical clichés such as "You're my angel, my guardian angel. God knows, i've been blessed with love" on the albums title track or "See heaven sent me an angel looking just like you" on "Alive". It's so easy to make the comparisons with Cliff Richard, but with time it's more likely that Gareth Gates will be compared to someone like Tom Jones. As the audience grows up with him and Gareth sees a little more of the world the very idea that by the end of each performance he has to be rescued from under a pile of knickers is not out of the bounds of probability. So there we have "What My Heart Wants To Say", an album which is more a sign of great things to come and a statement of intent rather than a truly perfect pop album. There's no denying that Gareth sings each and every line like it's his last, but what we really need is for him to truly reign in the ropes of control and demand that he takes over lyrical duties for the second album. The Gareth Gates story is such an interesting one with a tale of a working class underdog truly overcoming struggle with the old adage that the good truly will out. If that story could be put into song then Gates really will break free of the Pop Idol shackles and could become one of the greatest icons that ever graced this earth! !